Home Politics Black Money #RaGaSaga: What is next up for Rahul Gandhi? [dropcap color=”#008040″ boxed=”yes” boxed_radius=”8px” class=”” id=””]A[/dropcap]t a Press Conference hosted by Mumbai Marathi Patrakar Sangh at Azad Maidan, Mumbai, Dr. Subrmanian Swamy said that the onus of answering the British citizenship is on Rahul Gandhi as he has merely brought to the attention of the public what Rahul Gandhi had submitted to Companies House in Britain (equivalent of Registrar of Companies in India). In our previous posts we have listed three companies which appear to have been set up to receive kickbacks on a Submarine Spare Parts deals signed with a 380-year old French conglomerate DCNS. 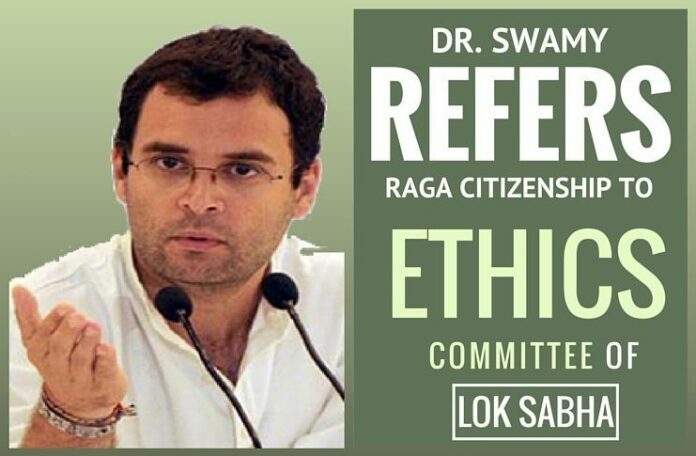 He further said that he had spoken to the Speaker of Lok Sabha, Dr. Sumitra Mahajan about referring Rahul Gandhi’s citizenship issue to the Ethics committee of Lok Sabha (Shri L K Advani is currently the chairman). In order to address a complaint, signature of a Lok Sabha MP was required and this has been obtained and the complaint will be filed in front of Ethics Committee of Lok Sabha for further action on Monday the 23rd. According to the Indian Constitution, Article 9 clearly states that a citizen of India is barred from voluntarily acquiring citizenship of another country. If it is confirmed that Rahul Gandhi is/ was a British Citizen, then he could be stripped of his Lok Sabha membership and his constituency Amethi will have to go to polls to re-elect a candidate. Dr. Swamy further said that Congress, instead of answering him has needlessly resorted to attacking the Prime Minister Narendra Modi, who had nothing to do with this Press Conference. This is in the public interest to know if a Member of Pariliament has committed a fraud or not.